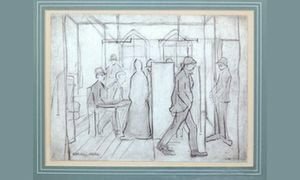 Two pencil drawings by LS Lowry, which were retrieved in a house clearance, have been sold for over £50,000 combined, reports The Yorkshire Post. The sketches which were found in a house clearance in Huddersfield and taken to Gary Don’s auction house in Leeds, where they were purchased by two separate buyers. A drawing of a Manchester polling booth from the 1920s sold for £24,725. The new owner said they would lend the work to the Lowry Gallery in Salford. The second drawing, of a viaduct in Whitby from 1960, sold for £26,450. The buyer pledged not to do anything with the drawing for twenty years, having purchased it as an investment. Such discoveries frequently turn up in house clearances, potentially reaching thousands of pounds. Don said the news had prompted other people to come forward with possible masterpieces of their own. The sale comes only days after another Lowry painting reached record prices at auction, demonstrating there is still a competitive market for works by the author. Lowry’s The Football Match from 1949 was sold at an auction for £5.6 million, according to The Daily Mail, which is the most anyone has ever paid for one of the artist’s paintings. He is best known for his simple depictions of working life in Manchester and his distinctive matchstick men.